If you have hammertoes, you aren’t alone. Hammertoe deformities affect tens of millions of Americans and can cause many different problems. Conservative treatment of hammertoe works for some patients, but surgery is necessary for many people. The traditional surgery for hammertoe has included use of a rigid wire (a.k.a. Kirschner Wire or “K-wire”) that is drilled into the end of the toe, and depending on surgeon preference, is placed temporarily or permanently. The k-wire method has many well-documented shortcomings that have spurred innovation in the medical device sector, resulting in the availability of numerous new “Next Generation” hammertoe implants. Many foot and ankle surgeons may not even be aware of the latest of these offerings, but they should. Recent data indicates relationship between use of newer technology, superior clinical outcomes and even higher patient satisfaction scores. This article provides a comparison of the newer technologies and summarizes the advantages and drawbacks associated with the newer types of hammertoe surgical implants. An estimated 60 million Americans are affected by hammertoes-a prevalent condition[i] that can cause pain[ii], inhibit your ability to walk[iii], and makes feet appear (as what most people would call) “ugly. Also, flexible hammertoe causes trauma that leads to toenail problems[iv] and sores. A bone infection called osteomyelitis is also common in hammertoe patients with plantar neuropathy[v]. Unfortunately, every year the number of patients diagnosed with loss of protective sensation to the bottom of their foot increases[vi]. Hammertoes often get to the point that patients are walking on the tip, rather than the bottom surface of the toe. Unfortunately, the skin on the tip of the toe does not have the same tolerance for bearing weight as the bottom surface. This leads to callus formation and signals the beginning of a vicious cycle. The cycle leads to pain for those with normal sensation and development of ulcers for those with diminished sensation. Conservative care of hammertoes includes the use of cushioning against the tips of the toes to shift the weight to other parts of the foot- also known as “offloading.” These methods may be effective for some patients, but surgery to replace the affected joint is ultimately necessary to bring back the needed function and appearance of the toes for many. Strength / Durability- Medical-grade titanium is the industry standard for implants, but some designs are constructed of materials that may not be as strong. An implant that’s not as strong could be at greater risk for breakage. Some materials might also involve prolonged weight bearing restrictions that could keep you from your normal activity longer than desired. Saws and Drills- Many hammertoe implants recommend use of heat-generating powered saws or reamers that can cause a phenomenon known as thermal osteonecrosis which is linked to implant failures. [viii] An implant that recommends a less traumatic device would be preferred. Procedural Steps- Less is more. Hammertoe implant procedures may involve as few as 5 steps, but others can require 8 or more. Shorter operative times benefit patient and physician alike. Configurations- All implants may not be available in appropriate configurations. Availability of a 10⁰ angle, straight, and a variety of naturally fitting implant sizes should be confirmed. One vs. Two-piece Designs- Most of the newer designs are comprised of a long, one-piece implant. This type requires a “Bayonet Type” insertion technique that results in additional intraoperative trauma to the patients’ tissues. Cannulated design- Very few of the new designs respect physicians’ preference for use of a K wire for added stability. Consider a cannulated design that accommodates a K wire. Environment- Some products are accompanied by pounds of proprietary, disposable, single-patient tools and materials. Use of environmentally-friendly products is preferable. Strong Hammertoe Correction- The reliability and strength of preferred Titanium construction. Atraumatic Bone Preparation- Avoids thermal osteonecrosis via use of bone cutting forceps. Simple / Reduced Operative Time- Save precious time by choosing a fast 5-step procedure. Choice of Configurations- Multiple sizes as well as zero and ten-degree options. Atraumatic & logical- Two-piece unit connects easily with final union confirmed by a click. Environmentally Responsible- No large disposable trays or instruments to go to the landfill. K-Wire Compatible- While optional, physicians who prefer, can easily use K-wires too. 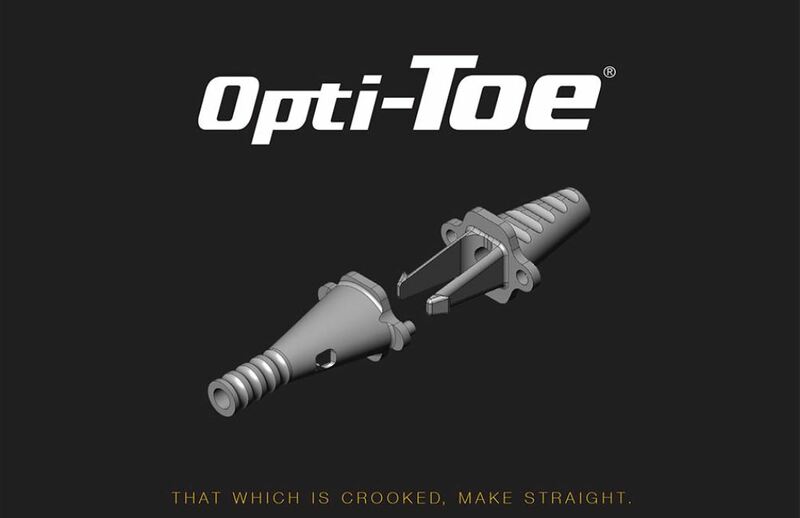 Opti-toe® by GraMedica provides the most comprehensive list of Surgeon-preferred features among currently offered implants for correction of hammertoe. [i] Patients. http://www.nextremitysolutions.com/patients/. Accessed March 29, 2018. [ii] Goo J. Foot pain. www.medicinenet.com/foot_pain/article.htm. Accessed March 29,2018. [iii] Weil, A. (2010, September 22). Hampered by Hammertoes? Retrieved from https://www.drweil.com/health-wellness/body-mind-spirit/feet/hampered-by-hammertoes/. [iv] Bakotic, B. (2006, September). Podiatry Today / A Guide to Detecting Nail Pathology. Retrieved from https://www.podiatrytoday.com/article/6042. [v] A.J. Boulton, R.S. Kirsner, L. Vileikyte. Clinical practice: Neuropathic diabetic foot ulcers. N Engl J Med, 351 (2004), pp. 48-55. [vi]Robinson, C. C., Balbinot, L. F., Silva, M. F., Achaval, M., & Zaro, M. A. (2013). Plantar Pressure Distribution Patterns of Individuals with Prediabetes in Comparison with Healthy Individuals and Individuals with Diabetes. Journal of Diabetes Science and Technology, 7(5), 1113–1121. [vii] Obrador, C, et al (2018) Comparative Study of Intramedullary Hammertoe Fixation. Foot & Ankle International, 39(4) 415-425. [viii] Cortical bone drilling and thermal osteonecrosis. Augustin, Goran et al. Clinical Biomechanics, Volume 27, Issue 4 , 313 – 325.